Tajine maadnous is a Tunisian egg cake made of meat, cheese, bread crumbs, onion, parsley, tomato, and turmeric. Tunisian tajines are similar to a quiche, but feature the distinctly Tunisian ingredients and spices, such as lamb, cumin, harissa, tuna, and olives. While most people think of large ceramic tajine pots made for cooking Moroccan tajine meat and vegetable stews, in Tunisia and Algeria, tajine has a completely different meaning. Tunisian tajine is a classic baked egg and cheese gratin dish filled with fresh vegetables, meats, spices, and herbs and is most often eaten hot or cold as an appetizer or with a light salad or couscous for a small meal. Tajines are often featured as a starter dish at Tunisian weddings or other festivities and celebrations. The premise of a baked egg dish filled with meat, vegetables, and spices is not specific to Tunisia. While Tunisians have tajine or tajin, Egyptians have the similar egg baked casserole tagen, also known as eggah. 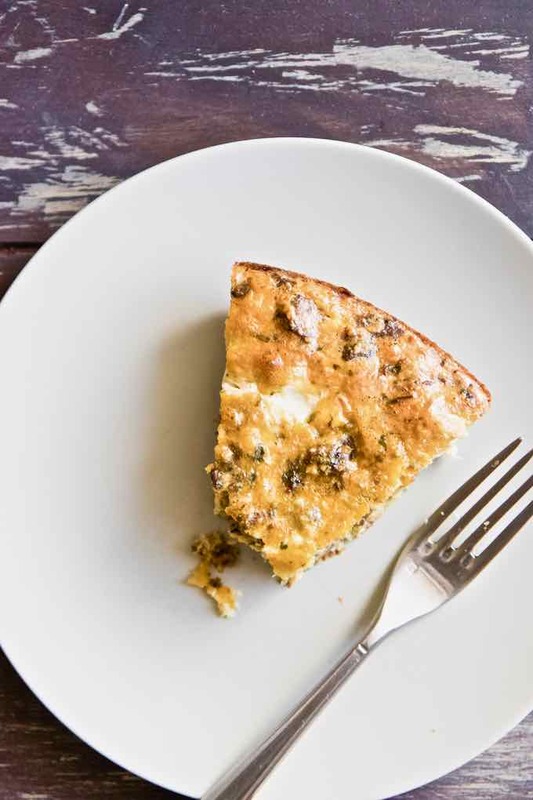 The French baked egg quiche is usually served with a crust, while the Spanish tortilla is a mixture of eggs, vegetables, and potatoes. The dish most similar to a Tunisian tajine is like the Italian frittata, which is a mixture of eggs, vegetables, and cheese and is baked in a shallow dish or pan. This tajine maadnous (also sometimes referred to as tajin ma’adnus) recipe features cooked minced meat (most often beef, lamb, or chicken) mixed with tomato paste and turmeric and then baked with eggs, sautéed onions, and parsley. Dried bread crumbs are added to the mixture to thicken and set the shape of the tajine, which is traditionally cut into pie-shaped or square pieces and eaten with your hands. There are many variations of Tunisian tajine and the tajine possibilities are endless. Tajine malsouga is made with brick leaves and also with liver, tuna, or harissa and is a common street food throughout Tunisia; the ingredients are often baked or fried within a filo dough. Tajine sebnekh is an egg and chicken bake made with vegetables and fresh herbs like cilantro or parsley. Other traditional tajines variations include spinach, chickpeas, bell peppers, saffron, merguez (sausage), and potato. Another similar baked egg dish popular in Tunisia is minina, a dish of Jewish descent which has become popular throughout the country and the North African region as a whole. While most Tunisians cook tajine in a shallow glass, cast iron, or ceramic baking dish, in the Tunisian countryside, it is traditional to cook the dish in an earthenware pot over a wood fire or hot embers. The pot is then covered with a lid and hot coals are piled on top, which allows the tajine to obtain a crispy and golden brown bottom and top but stay soft within. Not to mention the amazing smoked wood flavor! This tajine maadnous is a traditional Tunisian savory egg bake recipe that can be served at your next brunch or holiday. The dish is high in protein from the meat and eggs and, depending on the vegetables used, may also be high in fiber. Tajine is a great dish to make and use for leftovers as it can be refrigerated for five to six days after making and reheated or served cold.